Have a question on Cherokee? Cherokee is available in 6 different colors - Bright White, Billet Silver, Deep Cherry Red, Briliant Black, Sport Light Brownstone and Sport Patriot Blue. Watch latest video reviews of Jeep Cherokee to know about its interiors, exteriors, performance, mileage and more. 2014 Jeep Cherokee Limited ACTUAL OWNER Review!! Every peak attained by the renowned American Automobile Brand Jeep is evidently the summation of the praise fetched by the brand's assets for their performance. Another heir adorned with the brand's logo is Jeep Cherokee. The car is a mid-size crossover SUV from the Jeep division of Chrysler Group LLC, which was introduced for the 2014 model year at the 2013 New York International Auto Show. The compact SUV is the first Jeep vehicle to be built on the Compact U.S. Wide platform, co-developed by Chrysler and FIAT. Solemnly perceptible interiors of the car shows a perfect blend of technology and comfort enveloped in a sporty ambiance. Just sit on the driver's seat and the interiors place the key of a whole new world waiting to be explored. The diver is presented with a personalized instrument cluster, leather-wrapped 3-spoke multifunctional steering wheel, 8.4 inch Uconnect touchscreen navigation system and an ergonomically-configured control panel. The car features a luxurious amount of comfort added by the large leather dressed seats with flat fold front seats enclosing a hidden in-seat storage, the new CommandView dual-pane sunroof and superior sound system and air conditioning. The SUV, although being compact collects for you a cargo space of 504 litres, which can be extended to 1500 litres. 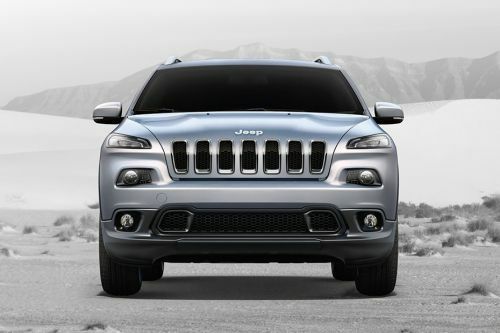 Rugged exclusiveness served in every glance, with the astounding exterior design of Jeep Cherokee. The exterior designers have crafted the front look of the car as such to display a robust stylishness, which is correctly demonstrated by the muscular bonnet with expressive impressions, the signature seven-slot grille, exclusive sharp and sleek head lights and the masculine front bumper. The stylish rear lamps, the new rear fascia design, the roof rails and the sharp side edges of the car hint the sportiness of the SUV. The compact yet wide exterior design of the car is a product of the dimensions of the car, which reads L x W x H is 4624 mm x 1903 mm x 1731 mm with all the dimensions in mm and for the biggest variant. The desirable SUV comes with 4 purely exclusive variants – the Sport variant, the Longitude variant, the Trailhawk variant and the Limited Variant, which are pumped-up by 2 available engine options namely- 2.4 Litre MultiAir2 TigerShark I4 petrol engine and the 3.2 Litre Pentastar V6 engine. The solemnly refined 3.2 Litre engine variant promises you an efficiently high performance with not less than a maximum power output of 271hp at 6500 rpm and a maximum torque of 316Nm at 4400 rpm. This well-cultivated engine hugs the new nine-speed automatic transmission, which gifts the SUV an ability to establish a speed of 100km/h from stand-still in 7.3 sec and a top-speed of 226 kmph. The SUV along with all these dynamic power and acceleration values can cover a stretch of 9.4 km in 1 litre of fuel. Safety is a part where the car beats its competitors. The car is installed with many advanced safety features, which are purely capable to cocoon the occupants with car. The handling of the car is polished to perfection by the stability features like the Select-Terrain traction control system with upto five customised settings: Auto, Snow, Sport, Sand/Mud, Rock modes, Electronic Stability Control (ESC), Hill Start Assist, brake assist and Anti-lock Braking System. The car further encloses safety attributes like the full-speed forward collision warning with crash mitigation, blind spot monitoring, parking assist, adaptive cruise control, Trailer Sway control and front, side and curtain airbags. The desirable retardation produced in the car is a result of the braking system consisting of front ventilated discs and rear solid discs. The correctly explained dynamism, well-crafted exterior, impressively perceptible interior and purely controlled ride of Jeep Cherokee could not be missed for its slightly expensive price. What is the price of Jeep Cherokee? On road prices of Jeep Cherokee in starts from AED124,900 for base variant Sport, while the top spec variant Limited costs at AED175,000 . What are the colors options available in Jeep Cherokee?